Ajayi is slated to undergo surgery on his torn ACL this Thursday, Ian Rapoport of NFL Network reports. Ajayi (knee) has been placed on IR. Analysis: Per Adam Schefter of ESPN, Ajayi suffered a torn ACL in Week 5. His placement on IR opens up added opportunities for Corey Clement and Wendell Smallwood and could lead to the team adding more depth at running back. Ajayi carried eight times for 29 yards and caught one pass for five yards during Sunday's 23-21 loss to the Vikings. He also lost a fumble. Analysis: Ajayi managed just just 3.6 yards per carry against a stout defensive front and hardly made an impact as a pass catcher. 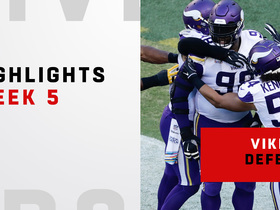 He contributed to the 17-point deficit his team faced early in the third quarter, fumbling in the red zone before Minnesota marched down the field for a score. Ajayi was coming off his best yardage output of the season, but his overall numbers through four appearances remain rather underwhelming. He'll look to get back on track Thursday against the Giants. Ajayi ran for 70 yards on 15 carries and added 11 yards on three catches during Sunday's 26-23 loss to the Titans. Analysis: It was a solid return from the back injury that kept him out of Week 3. Ajayi failed to score for the first time this season, but partially made up for it with a season high in yardage. The three-year vet continues to be a pretty solid starting option given his share of carries -- 61.2 percent in the two full games in which he has appeared -- in an offense led by a MVP-caliber quarterback. He should get some opportunities to score against a down-in-the-dumps Vikings defense Sunday. Head coach Doug Pederson confirmed Friday morning that Ajay will be able to play through the small fracture in his back, Jeff McLane of The Philadelphia Inquirer reports. Analysis: Ajayi said Thursday that he plans to continue playing despite the fracture in his back, and Pederson confirmed that Friday, noting that the injury "sounds bad" but is not the type that automatically forces a player to the sideline. Ajayi figures to be playing through some pain Sunday, and likely beyond, but as long as he is able to manage it he will continue having a role in the Eagles' backfield. Ajayi, who was a full participant in Thursday's practice, revealed that he's dealing with a small fracture in his back, but intends to play through the issue, Zach Rosenblatt of NJ.com reports. "I'm ready to roll," Ajayi said. "I feel like it's been a minute since I've played and it's only been one week. I'm chomping at the bit to get out there." Ajayi (back) was listed as a full participant in Thursday's practice. Ajayi (back) returned to practice Thursday, Dave Zangaro of NBC Sports Philadelphia reports. Analysis: On Monday, coach Doug Pederson said he expected Ajayi and Darren Sproles (hamstring) to return for Sunday's game at Tennessee, but only the former has made an appearance in practice this week. It remains to be seen how many reps Ajayi will be able to take on Thursday, but he's trending in the right direction for a return to action. Ajayi (back) isn't practicing Wednesday, Jeff McLane of The Philadelphia Inquirer reports. Analysis: Ajayi isn't doing any work with his teammates, but he's at least running on a side field under the supervision of the Eagles' training staff. His inability to practice suggests he's no lock to return for Sunday's game in Tennessee, even though coach Doug Pederson sounded optimistic when talking with the media Monday. Meanwhile, McLane reports that fellow running back Darren Sproles (hamstring) was stretching alongside his teammates at the start of Wednesday's practice, albeit without a helmet. Coach Doug Pederson expects both Ajayi (back) and Darren Sproles (hamstring) to return for Sunday's game in Tennessee, Tim McManus of ESPN.com reports. Analysis: Both running backs were held out of practice all last week and ruled out on the Friday injury report ahead of Sunday's 20-16 win over Indianapolis. Pederson previously said Ajayi was a bit ahead of Sproles in terms of recovery timeline, but it now seems both are approximately on the same track, likely targeting a return to practice within the next few days. The Wednesday injury report should provide a more tangible indicator of Ajayi's progress. Ajayi (back) has been ruled out for Sunday's game against the Colts, Zack Rosenblatt of NJ.com reports. Analysis: Darren Sproles (hamstring) will also be sidelined, and Corey Clement (quad) is listed as questionable after being added to the injury report Friday. The most likely scenario features Clement suiting up and handling the lead role, with Wendell Smallwood and Josh Adams providing depth. Tom Pelissero of NFL.com reports that Clement is expected to be fine for the game. Ajayi (back) was not present at the beginning of Friday's practice, Martin Frank of The Delaware News Journal reports. Analysis: The same applies to fellow running back Darren Sproles (hamstring), and if both end up ruled out for Sunday's game against the Colts, expect a heavy dose of Corey Clement in Week 3. Head coach Doug Pederson said Friday morning that Ajayi (back) remains day-to-day, and a decision on his Week 3 status will be made after practice, Zack Rosenblatt of NJ.com reports. Analysis: Ajayi did not practice either Wednesday or Thursday, but based on Pederson's comments he still has a chance to suit up Week 3. Expect Ajayi's status to be updated further after Friday's practice comes to a close. Ajayi (back) didn't participate in practice, Jeff McLane of The Philadelphia Inquirer reports. Analysis: After a second consecutive absence Thursday, Ajayi will have one more opportunity to test out his back injury in practice this week. Fellow running back Darren Sproles (hamstring) seems to have even less of a chance to play Sunday against the Colts, which could place the onus of backfield touches on Corey Clement and, to a lesser extent, Wendell Smallwood. Ajayi (back) wasn't present for the portion of Thursday's practice available to the media, Dave Zangaro of NBC Sports Philadelphia reports. Ajayi (back) didn't participate in practice Wednesday. Eagles head coach Doug Pederson said he views Ajayi (back) as day-to-day ahead of the team's Week 3 matchup with the Colts, Mike Garafolo of NFL Network reports. Eagles offensive coordinator Mike Groh said that there's a "good chance' Ajayi (back) won't be available for Sunday's game against the Colts, Reuben Frank of NBC Sports Philadelphia reports. 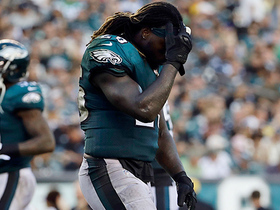 Ajayi said after the Eagles' 27-21 loss to the Buccaneers on Sunday that his back injury would require management and acknowledged that he has to "get himself right," Jeff McLane of The Philadelphia Inquirer reports. 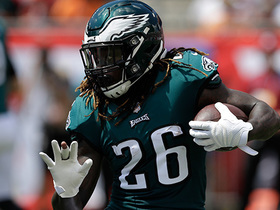 Ajayi rushed seven times for 23 yards and a touchdown and secured his only target for four yards in the Eagles' 27-21 loss to the Buccaneers on Sunday. Analysis: Ajayi overcame an in-game back injury to return to the contest in the second half, and his two-yard scoring run with nine seconds left in the third quarter brought the Eagles to within 27-13 at the time. The time Ajayi spent on the sideline naturally kept his workload modest, but the 25-year-old encouragingly has three touchdowns over his first two games. Assuming his back doesn't remain an issue, Ajayi will look to up his overall production in a favorable matchup against the Colts in Week 3. Ajayi (back) returned to Sunday's contest in Tampa Bay. Analysis: Ajayi was removed early and diagnosed with a back injury that forced a visit to the locker room. However, he was seen on the sideline with his helmet late in the first half and proceeded to open the third quarter with a 20-yard run. His touches could be limited the rest of the game, but he appears to be healthy enough to finish it out. Ajayi is questionable to return to Sunday's game at Tampa Bay due to a back injury. 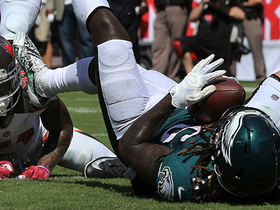 Analysis: With Darren Sproles (hamstring) sidelined Week 2, Ajayi was a prime candidate to take on a larger workload moving forward, as coach Doug Pederson told Zack Rosenblatt of NJ.com on Friday. With Ajayi's return to action now murky, though, the Eagles will turn to Corey Clement and Wendell Smallwood to man the backfield. Head coach Doug Pederson suggested Friday that Ajayi could take on a heavier workload in future weeks, Zack Rosenblatt of NJ.com reports. Ajayi rushed 15 times for 62 yards and two touchdowns in the Eagles' 18-12 win over the Falcons on Thursday. Ajayi (foot) doesn't carry an injury designation for Thursday's game versus the Falcons, Zach Berman of The Philadelphia Inquirer reports. Analysis: Held out as a precaution during Sunday's session due to a foot injury, Ajayi turned in a limited practice followed by two full ones in preparation for the Eagles' regular-season opener. He'll thus be ready to handle the initial reps out of the backfield as the Eagles' starter, but Darren Sproles and Corey Clement will be on hand to serve as change-of-pace options. The Eagles listed Ajayi (foot) as a full practice participant Tuesday. Analysis: Ajayi is thus on track to play in Thursday's season-opener against the Falcons. Considering the team will be without top wideout Alshon Jeffery (shoulder) and that No. 1 QB Carson Wentz (knee) isn't quite ready to play, it wouldn't surprise us if Ajayi saw a decent amount of handoffs from the team's capable No. 2 signal-caller, Nick Foles, in Week 1. Ajayi (foot) practiced again Tuesday, Eliot Shorr-Parks of Sports Radio 94 WIP Philadelphia reports. Analysis: Ajayi, who was limited at practice Monday, continues to trend toward being available for Thursday's season opener against the Falcons. It remains to be seen, however, if the Eagles list their top running back as questionable for the contest or remove him altogether from their Week 1 injury report. Ajayi (foot) was limited in practice Monday, Adam Caplan of SiriusXM Radio reports. Analysis: Despite an inability to practice Sunday due to a foot injury, Ajayi is expected to suit up for Thursday's regular-season opener against the Falcons. After joining the Eagles last season, his touches wavered between six and 21 in the team's march to a Super Bowl win, so his workload could be game-dependent with capable reserves Corey Clement and Darren Sproles also on hand. Ajayi (foot) returned to practice Monday, Jeff McLane of The Philadelphia Inquirer reports. Analysis: Ajayi was a non-participant Sunday due to a foot injury, but his presence Monday bodes well for active status for Thursday's opener against the Falcons. With Nick Foles under center, the Eagles may rely more on the ground game than a season ago, when he averaged 12.8 touches per game (including playoffs). Ajayi was held out of Sunday's practice with a foot injury, but he expects to participate Monday, Tim McManus of ESPN.com reports. Analysis: The reports seem to imply the foot injury is different from the unspecified lower-body injury that held Ajayi out of practice the past two weeks. A Monday return would put him on track for Thursday's season opener against the Falcons, especially if he's listed as a full participant on the first injury report of the season. Ajayi (undisclosed) isn't practicing Sunday, Jeff McLane of The Philadelphia Inquirer reports. Analysis: Speaking to the media earlier in the day, coach Doug Pederson said Ajayi would return to practice this week and play in Thursday's season opener against the Falcons. Ajayi will still have a couple more chances to rejoin his teammates, but he's limited to side work with the training staff Sunday afternoon, per Dave Zangaro of NBC Sports Philadelphia. The Eagles will turn to Corey Clement as their lead runner if Ajayi doesn't meet his coach's expectation of Week 1 active status. Coach Doug Pederson said Sunday that Ajayi (undisclosed) will practice this week and be ready for Thursday's season opener against the Falcons, Jeff McLane of The Philadelphia Inquirer reports. Analysis: Ajayi has been absent from practice the past two weeks while nursing an unspecified lower-body injury. The Eagles haven't expressed concern about the situation at any point, but it's nonetheless something that will need to be monitored in the coming days. 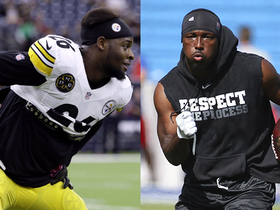 The team will release its first injury report of the season after Monday's practice. Ajayi (lower body) isn't practicing Tuesday, NJ.com's Zack Rosenblatt reports. Ajayi (lower body) missed another practice Monday, Jeff McLane of The Philadelphia Inquirer reports. Analysis: Ajayi has been out for more than a week, without any updates on a timeline or the specific nature of his injury. 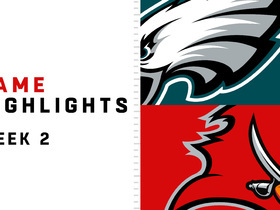 The Eagles are only 10 days away from the season opener next Thursday (Sept. 6) against Atlanta. Should Ajayi's injury linger, Corey Clement might find himself handling a heavy workload on the ground. Ajayi (lower body) remained sidelined at Sunday's practice, Zach Berman of The Philadelphia Inquirer reports. Analysis: As Ajayi's unspecified injury issue lingers, the Eagles welcomed fellow running backs Corey Clement and Donnel Pumphrey back to practice Sunday. We'll consider Ajayi day-to-day for now, though it's safe to say that he won't play in Thursday's preseason finale against the Jets, even if that's only a precautionary measure. Ajayi is dealing with a lower-body injury and won't play in Thursday's preseason game against Cleveland, Zach Berman of The Philadelphia Inquirer reports. Ajayi missed practice for a second day in a row Monday, Dave Zangaro of NBC Sports Philadelphia reports. Analysis: The Eagles haven't commented on Ajayi, one way or another, so it's unclear if an injury or some type of personal matter is impacting his availability. He's so far made appearances in both of the Eagles' preseason games, racking up 10 carries for 33 yards and one catch for 16 yards on 22 offensive snaps. Assuming he's healthy, Ajayi is expected to eat up the largest piece of the pie afforded Eagles running backs in 2018. Ajayi carried the ball four times and tallied 20 yards during Thursday's 31-14 loss to the Steelers. Analysis: Ajayi's highlight of the night came midway through the first quarter when, with Eagles operating out of their own end zone, the powerful back bulldozed through the Steelers' defense for a 22-yard gain. 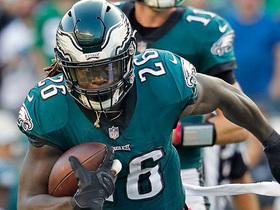 The Eagles have a deep and varied backfield heading into this season, but with LeGarrette Blount now in Detroit, Ajayi should get the bulk of the carries in Philly's offense. Entering a contract season, Ajayi has a ton of incentive to make the most of those opportunities. Ajayi could be tasked with a heavy workload heading into a contract season, Jimmy Kempski of Philly Voice reports. Eagles executive vice president Howie Roseman said Wednesday that he expects Ajayi to get "more involved" in the team's offensive game plans during the upcoming season, Joe Schad of The Palm Beach Post reports. Ajayi (ankle) practiced in full Wednesday. Analysis: Last week, Ajayi followed a full session Wednesday with limited participation Thursday and Friday. However, the Eagles didn't attach a status to the running back, indicating he would have been active if a game was played this past Sunday. With a full practice to kick off this week, Ajayi seems set to lead the backfield Sunday against the Patriots, as he has in the first two playoff games. In those outings, he earned the most offensive snaps (60) and touches (39) among Philly running backs. Ajayi (ankle) was a limited practice participant Friday. 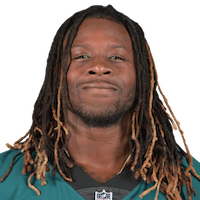 Analysis: In nine contests as an Eagle (including playoffs), Ajayi has averaged 77.3 yards from scrimmage per game and scored a pair of touchdowns. Based on Friday's injury report, if the Eagles were playing this Sunday, Ajayi would be free of an injury designation. The running back is thus firmly on track to be available when his team faces the Patriots on Feb. 4 in Super Bowl LII. Ajayi (ankle) was limited in practice Thursday. Analysis: In the Eagles' first session related to the Super Bowl, Ajayi is tending to an ankle injury. There wasn't much worry when he was estimated as a full participant on Wednesday's injury report, but reduced reps one day later doesn't imply the running back will be compromised once Feb. 4 rolls around. Considering there's a week and a half before the big game, Ajayi is a good bet to rid himself of injury in the meantime. Ajayi rushed 18 times for 73 yards and caught all three of his targets for 26 more during Sunday's 38-7 win over the Vikings in the NFC championship. Ajayi carried 15 times for 54 yards and caught three of five targets for an additional 44 yards during Saturday's 15-10 win over the Falcons. Ajayi (knee) was a full practice participant Tuesday. Analysis: Per Jeff McLane of The Philadelphia Inquirer, the session included full pads, so it would appear Ajayi has overcome the soreness in his right knee that sprung up during the Eagles' first-round bye. During his stay in Philly, Ajayi has avoided the injury report, and while he didn't do so this week, his ability to handle every rep Tuesday sets himself up nicely for Saturday's divisional-round matchup with the Falcons, who conceded the 13th-most rushing yards during the regular season. Ajayi is dealing with a sore right knee and could be rested during the Eagles' practices this week, Paul Domowitch of the Philadelphia Daily News reports. Ajayi (coach's decision) is inactive for Sunday's game against the Cowboys, Jeff McLane of The Philadelphia Inquirer reports. Analysis: Though quarterback Nick Foles is slated to start in the regular-season finale, the Eagles will rest Ajayi and several other key contributors with the team having sewn up the NFC's No. 1 seed in the playoffs. 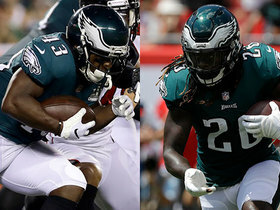 While LeGarrette Blount and Corey Clement have worked in tandem with Ajayi as the team's primary backs in recent weeks, the first two could see their usage limited Sunday as Eagles head coach Doug Pederson gives more burn to lightly used backs Wendell Smallwood and Kenjon Barner. The Eagles aren't expected to hand Ajayi extended snaps in Sunday's game against the Cowboys, Paul Domowitch of The Philadelphia Inquirer reports. Ajayi rushed 14 times for 52 yards and caught two of his three targets for 21 yards and a touchdown, but he also lost a fumble in Monday night's 19-10 win over the Raiders. Ajayi ran for 49 yards on 12 carries and added 40 yards on two catches during Sunday's 34-29 win over the Giants. Ajayi carried 15 times for 78 yards and caught one pass for an additional two yards during Sunday's 43-35 win over the Rams. Analysis: Ajayi led the team in carries and rushing yardage in this one, with the other backs totaling just 36 yards on 13 totes. His long gain went for 19 yards, but he spent most of the afternoon accumulating tough yards in between the tackles. Fresh off his largest workload as an Eagle, Ajayi could all experience an increase in usage next week against the Giants if Carson Wentz (knee) is forced to miss time with an injury he sustained late in this game. Ajayi led the Eagles backfield with 31 snaps (41 percent) in Sunday's 24-10 loss to the Seahawks, Dave Zangaro of NBC Sports Philadelphia reports. Ajayi gained 26 yards on five carries and seven yards on one reception in Sunday's 31-3 win over the Bears. Ajayi rushed seven times for 91 yards during Sunday's 37-9 victory over the Cowboys. He added 10 yards on one reception. Eagles head coach Doug Pederson said Wednesday that the team will "keep increasing" Ajayi's role in the offense "a little bit each week," Martin Frank of The Delaware News Journal reports. Ajayi rushed for 77 yards and a touchdown on eight carries in Sunday's 51-23 win over Denver. Analysis: Few expected much from Ajayi after being with the team for just a few days, but he quickly got into rhythm, rumbling for a 46-yard touchdown scamper just before halftime. Ajayi offers similar power as LeGarrette Blount, but more wiggle and receiving ability. 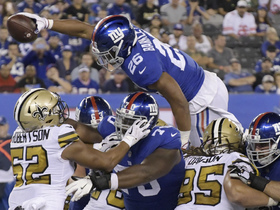 He won't be the man in Philadelphia to the same extent as he was in Miami -- where he dominated the backfield stable -- but he showed on Sunday that he might still be a fantasy-worthy starter. Ajayi is active for Sunday's game against the Broncos, Dave Zangaro of NBC Sports Philadelphia reports. Analysis: Only five days removed from his move from Miami to Philadelphia, Ajayi will be a part of the game plan in his first opportunity to do so. According to Jay Glazer of Fox Sports, there's an expectation of 10-to-15 snaps for the third-year pro in his Eagles debut behind No. 1 back (for now) LeGarrette Blount. However, Zach Ertz (hamstring) was a late scratch, which could put more onus on the backfield to keep the offense moving along. Ajayi is expected to make his Eagles debut Sunday against the Broncos, a source informed Ian Rapoport of NFL Network. Eagles head coach Doug Pederson said Friday that he still isn't sure if Ajayi will play in Sunday's game against the Broncos, Eliot Shorr-Parks of NJ.com reports. Analysis: Pederson said Ajayi is learning 10-to-15 plays, which might allow the running back to enter the game in a limited capacity against a stifling Denver run defense. Given the matchup and limited expected volume, Ajayi can't be counted on for much production even if he ends up active Sunday. He should be ready to contribute in a major way when the Eagles come back from a Week 10 bye. Eagles head coach Doug Pederson was noncommittal Wednesday when asked if Ajayi, who was acquired from the Dolphins on Tuesday, would play in Sunday's game against the Broncos, Eliot Shorr-Parks of NJ.com reports.